We’ve all seen the video of that guy who proposed to his girlfriend at Yankee Stadium who promptly lost his ring requiring everyone to get down on their hands and knees looking for it. If you haven’t, that last sentence was so descriptive I bet you feel like you just did or you can check it out here. But I mean, was he wrong to take matters into his own hands and leave the ballpark out of it? What was the alternative? Desperate for answers, I went down the list of our nation’s baseball parks to see just what they offer you, and how much it’ll cost to take this gargantuan step at a place that also buys mayonnaise in tubs. 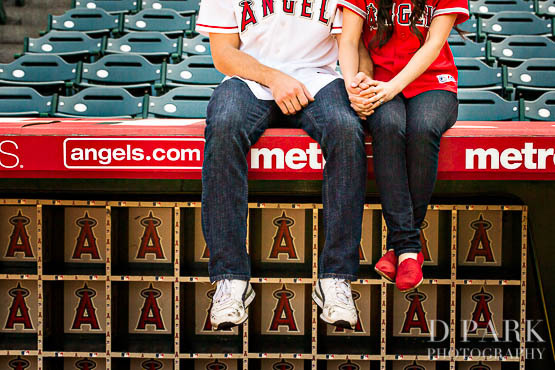 There might be Angels in the outfield, but there are no proposals in the stands. Thanks for nothing, Joseph Gordon-Levitt. What the hell, Kansas City?! You can wear your crown, but us peasants have to keep our jewels out of your ballpark?! JEEZ. I mean, the view of the highway was going to be too romantic anyway, so thanks for saving me the ring selfie. Heartbreaking, but true. I mean, I get it, it’s a scheduling nightmare. By the time you get your Shake Shack order the game’s over. Oh well. Let’s Go Mets. Camden Yards fancies themselves too beautiful a park to be tarnished by your engagement. I mean, they got enough publicity from the Seinfeld episode when Elaine wears and Orioles hat to a Yankee Game, so what more could they want? Exotic Location. The highest ranked ballpark with nothing to offer. Congrats! So basically I’m paying $100-$250 for a glorified half-tweet? Not the greatest value for a jumbotron message, but still very much worth it for one of the prettiest ballparks in the country. The view of the bay will have you saying “But first, let me take a ring selfie.” And I will pay anything to get on the KISS CAM… BUT ARE YOU KIDDING ME?! Not terrible, but getting down on one knee in a rain poncho is not the best look. If you live in the Bay Area and are looking for a discount proposal at a ballgame, the A’s have you covered. Interestingly enough, if an MLB General Manager you’re looking for a discount ballplayer, the A’s also have you covered. Go anywhere else. You are in Chicago. Go anywhere else that doesn’t have large downward arrows everywhere. Try again. Go anywhere else. You are in San Diego. Go anywhere else. Try again. The hardest part about proposing at Coors Field is deciding who’s home run to do it after. You only have a brief window of about 7 seconds, so it’s best to go in with a few players in mind. Trevor Story is a nice touch. “And now OUR story begins”… or whatever… not that. Just a video message, but this new ballpark has lost of activities to make your proposal a family and friends event! Not bad. $38.50. Not $38.00 or $39.00, but a steal $38.50. I wonder if they have change for two twenties. DON’T DO IT IN THE POOL. Not a ton of proposals at Wrigley Field considering they’ve only had two rings in 108 years! OOOOOOOOOHHHHHHHHHHHHHH! But seriously marry me, Anthony Rizzo. Everything is bigger in Texas, so why not go big at an Astros game? The really nice gesture is that this package includes tickets to the game, so if the proposal goes foul hopefully your $500 gets you good seats! By far the most expensive park to propose in, but after all, Hollywood is all about going big, right? Honestly, $2,500 might be worth it depending on the cinematographer. The most expensive Scoreboard Message, but how else are they gonna pay for Bryce Harper, Max Scherzer and Stephen Strasburg in 2020? Gotta make that paper! Just a serious lack of effort from the team who plays in an old vacuum bag. Step it up, Tampa Bay! Jumbotron message or a printed sign hand delivered by a mascot? Sounds great, until you see who’s delivering it. Rosie Red not only brings you a gift, she also brings the first real test of your engagement. Expensive, but you do get to propose in an air conditioned environment, so I get it. The Red Sox find themselves high on this list because I thought it would be more expensive. Seriously, $350 is a steal! Plus you get to meet Wally! What could be better!? The Minnesota Twins are all about value. They deliver that with this package. Solid stuff, Minnesota. The St. Louis Cardinals find themselves breaking the top five, but they almost didn’t it. I mean, getting to propose on the field is awesome, but after a tour of the stadium? That’s not really a great time. You risk your significant other being tired, or hungry or disappointed, or having just walked by Mike Matheny. There’s too many variables. And you can’t do it on a game day? BOO. “We got engaged at our favorite place and then went home to watch the second game of the road trip.” Terrible, but still a little cool. If there’s one thing people know about me, it’s my love for bubbly things. Seltzer is my go-to, but prosecco and champagne are my drink of choice. Within the Phillies package, they put you up on the scoreboard to propose, give you tickets to the game, a commemorative DVD, but most importantly, they give you champagne. Good for you Philadelphia, your players’ heads are falling off, but you have good taste! Fireworks you don’t have to pay for? Sounds like a plan. There are a lot of mascot meetups towards the end of this list, but Texas breaks right on through to #2 for the sole reason that it’s mascot is a horseman. Not like the headless horseman, like the body of a man, head of a horse. Bojack Horseman’s Cousin “Ranger’s Captain” is going to be forever a part of your special day, and the Texas Rangers will give you the photos as evidence. Ladies and Gentlemen, the Detroit Tigers offer the most comprehensive Ballpark Proposal in the league. For $50 bucks you get not only a gift from the Tigers, you also get a distraction! This is key here, people. I would pay $50 to play an in-game scoreboard trivia game without getting proposed to. I’m sure we would all lose our minds if it happened to us! So coupling that insane excitement with the surprise of getting engaged and THEN being on the Jumbotron? I mean, that’s not only a moment to remember, it’s the best start to the rest of your life I can imagine! All in all, it’s important to remember that the moment is about the two of you, never lose sight of that. When the most important person in your world is standing in front of you, there’s no wrong way to pop the question. That’s the important takeaway. Home Runs last a second, but love lasts a lifetime. Plus, once you’re engaged, you know of a really great calligrapher who gave you some great proposal tips! Check me out @ordershewrotenyc or at ordershewrotenyc.com. Until next time, this is Joanna, and remember…. Jo Knows.